Multicolored inflators are composed of anodized aluminum and are available in red, blue, black, silver and gold finishes. 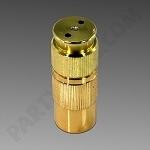 Brass inflators are another option available and known for their durability. Both styles are 3 inch standard and work perfectly with any chargers.